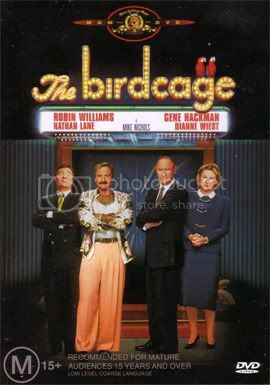 Directed by Mike Nichols, The Birdcage is a remake of the 1978 French film/play La Cage aux Folles, about gay cabaret owner Armand Goldman (Robin Williams) and his drag queen companion Albert (Nathan Lane) who is also the star of the cabaret, reluctantly agree to play it straight so their son can introduce them to his fiancé's ultraconservative republican parents, play by Gene Hackman and Diane Wiest. The plot is relatively simple and easy to follow and is well balance with the subplot, going back and forth until tying in together nicely for the second half of the film. The tropical style music suits the night club atmosphere of South Beach, Florida and fits in well with the film’s theme as a well as the recurring song We Are Family by Sister Sledge. The cinematography does a great job of capturing Florida’s tropical climate with bright colours and an orange overtone to create the feeling of summer heat. It’s also works as a refection of the character’s life style within that homosexual community. The casting in this movie is spot on. Nathan Lane and Robin Williams are terrific and have great chemistry as the happily “married” gay couple, even though it is a bit stereotypical. Gene Hackman is well suited in his role as republican senator Kevin Keeley along with his supporting and devoted wife Diane Wiest. Who both have their fair share of hilarious moments, particularly Hackman; and of course not to mention Hank Azaria as the Goldman’s gay and outrageously flamboyant Guatemalan house-keeper Agador. I was very satisfied in how the movie ended. It wasn’t rushed and it didn’t leave me with any questions as to what happens now, just a whole lot of laughter. The Birdcage is a comedy that’s full of energy, with superb camp value and knee slapping hilarious one-liners that are delivered perfectly. And in a time where gay marriage is treated as such a serious and political issue this is a great film that enables you to just sit back relax and have a good laugh. Good review, but if you haven't seen La Cage aux Folles, you should definitely check it out. I think you'd reconsider your rating of 5 stars for this film. The original is much better. Thanks, I haven't seen La Cage aux Folles but I would very much like too. I know in many cases the original is often better than the remake but I love the remake so much I don't think anything would make me reconsider my rating. Years ago my best friend re-enacted a scene by filming himself and inserting bits from film, it was hilarious!